We all know that sometimes after uninstalling a software application from our system, some traces still remain, like registry keys, settings files and other application data. For these cases, special utilities have been developed to help you completely erase all traces left behind by any program. AVG Remover eliminates all the parts of your AVG installation from your computer, including registry items, installation files, user files, etc. 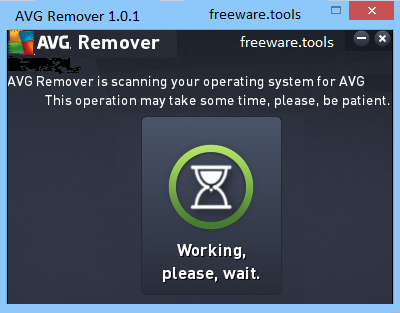 AVG Remover is the last option to be used in case the AVG uninstall / repair installation process has failed repeatedly. Simply stated, this is a simple-to-handle tool that analyzes your system in order to remove AVG products. Uninstallers that target specific applications are quite often encountered, especially when security solutions are involved, given their rather sensitive nature. This is the case of AVG Remover, a dedicated tool that can assist you in cleaning your PC after the uninstallation process for one or more AVG products was unsuccessful. Once you start it, the program searches for traces such as user settings, antivirus parameters, the Virus Vault, installation files and other such remnants that may have resulted after a failed removal attempt made using the built-in uninstaller of the security software. All the discovered items are removed on the spot, or after a reboot, and no traces are left behind. An important aspect that should be taken into consideration when using AVG Remover is that your system will restart several times in order to complete the cleaning procedure. This is the reason for which you are advised to save your work and close all other running applications prior to deploying this utility. To sum things up, with AVG Remover you get a really easy-to-use tool that does its job with the uttermost simpleness, requiring no advanced knowledge or intricate configurations. The nature of the software means that it should be handled with extra care to avoid losing data, but no special precautions are necessary other than those preceding a usual system reboot.